Frida Kahlo is an amazing role model for all children, but girls especially: she was groundbreaking, resilient, passionate about art and life, and a determined feminist. So we were thrilled to find out about these handmade and organic Frida Kahlo dolls, available exclusively at Noble Carriage, a website offering toys, gifts, and baby clothes that have high standards for sustainability. Each Kahlo doll is handmade with organic linen and totally unique, just like Ms. Kahlo herself. You or your little one can choose from a version with pink shoes and a pink satin trimmed removable linen skirt, or one with an organic indigo cotton dress with matching shoes, or a mini Kahlo sporting an organic ivory dress with pink shoes. Details on these carefully crafted dolls speak volumes about Kahlo’s legacy (both artistic and physical): above Kahlo’s trademarked unibrow is a handmade flower crown, and the dolls also come with the word “amor” (love) stitched on their chest. All of the 22-inch dolls are stuffed with hypoallergenic polyfill. 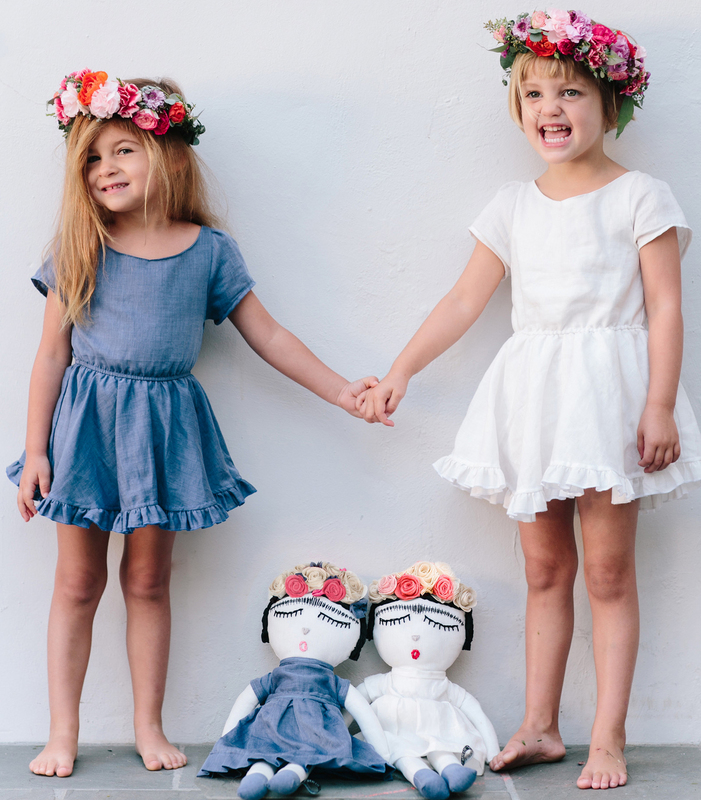 Maroma + Arte, the company that makes the dolls was created by two siblings from Kahlo’s home country of Mexico. Whether these Kahlo dolls get plenty of active playtime and enter your child’s world of make believe or they maintain the role of muse, silently observing as your little one flexes her artistic muscles through arts and crafts, we know the original bold and beautiful Kahlo would approve and cheer her on in her creative pursuits. Frida Kahlo is an amazing role model for all children, but girls especially: she was groundbreaking, resilient, passionate about art and life, and a determined feminist. So we were thrilled to find out about these�handmade and organic Frida Kahlo dolls, available exclusively at Noble Carriage, a website offering toys, gifts, and baby clothes that have high standards for sustainability. Each Kahlo doll is handmade with organic linen and totally unique, just like Ms. Kahlo herself. You or your little one can choose from a version with pink shoes and a pink satin trimmed removable linen skirt, or one with an organic indigo cotton dress with matching shoes, or a mini Kahlo sporting�an organic ivory dress with pink shoes. Details on these carefully crafted dolls speak volumes about Kahlo's legacy (both artistic and physical): above Kahlo's trademarked unibrow is a handmade flower crown, and the dolls also come with the word "amor" (love) stitched on their chest. All of the 22-inch dolls are stuffed with hypoallergenic polyfill. Maroma + Arte, the company that makes the dolls was created by two siblings from Kahlo's home country of Mexico. Whether these Kahlo dolls get plenty of active playtime and enter your child's world of make believe or they maintain the role of muse, silently observing as your little one flexes her artistic muscles through arts and crafts, we know the original bold and beautiful Kahlo would approve and cheer her on in her creative pursuits.